Since last year, we’ve been working to bring the convenience of Direct Carrier Billing to more Android Market users on more carrier networks. Building on the launches to T-Mobile US and AT&T users in 2010, we’ve recently launched Direct Carrier Billing to users on three popular networks in Japan -- SoftBank, KDDI, and NTT DOCOMO. The momentum continues and today we’re excited to announce that Direct Carrier Billing is now available on Sprint. We've begun a phased roll-out of the service that will reach all users in the next few days. 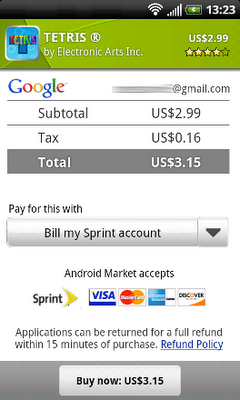 When complete, Android users on the Sprint network will be able to charge their Android Market purchases to their Sprint mobile bill with only a few clicks. We believe that Direct Carrier Billing is a key payment option because it lets users purchase and pay for apps more easily. It’s also important because it offers a convenient way to buy in regions where credit cards are less common. We are continuing to partner with more carriers around the world to offer carrier billing options to their subscribers. Watch for announcements of new payment options coming in the months ahead. Recently, there’s been a lot of misinformation in the press about Android and Google’s role in supporting the ecosystem. I’m writing in the spirit of transparency and in an attempt to set the record straight. The Android community has grown tremendously since the launch of the first Android device in October 2008, but throughout we’ve remained committed to fostering the development of an open platform for the mobile industry and beyond. We don’t believe in a “one size fits all” solution. 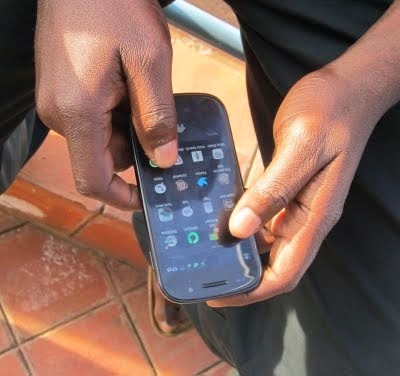 The Android platform has already spurred the development of hundreds of different types of devices – many of which were not originally contemplated when the platform was first created. What amazes me is that even though the quantity and breadth of Android products being built has grown tremendously, it’s clear that quality and consistency continue to be top priorities. Miraculously, we are seeing the platform take on new use cases, features and form factors as it’s being introduced in new categories and regions while still remaining consistent and compatible for third party applications. As always, device makers are free to modify Android to customize any range of features for Android devices. This enables device makers to support the unique and differentiating functionality of their products. If someone wishes to market a device as Android-compatible or include Google applications on the device, we do require the device to conform with some basic compatibility requirements. (After all, it would not be realistic to expect Google applications – or any applications for that matter – to operate flawlessly across incompatible devices). Our “anti-fragmentation” program has been in place since Android 1.0 and remains a priority for us to provide a great user experience for consumers and a consistent platform for developers. In fact, all of the founding members of the Open Handset Alliance agreed not to fragment Android when we first announced it in 2007. Our approach remains unchanged: there are no lock-downs or restrictions against customizing UIs. There are not, and never have been, any efforts to standardize the platform on any single chipset architecture. Finally, we continue to be an open source platform and will continue releasing source code when it is ready. As I write this the Android team is still hard at work to bring all the new Honeycomb features to phones. As soon as this work is completed, we’ll publish the code. This temporary delay does not represent a change in strategy. We remain firmly committed to providing Android as an open source platform across many device types. The volume and variety of Android devices in the market continues to exceed even our most optimistic expectations. We will continue to work toward an open and healthy ecosystem because we truly believe this is best for the industry and best for consumers. 2,800 people visited the contest page. 360 people tried answering the questions. 1 person got all six right. 200 people did well enough to get into Round 2. 38 of the apps worked well enough to be worth considering. 10 apps (exactly) got a “Nice” rating from the first-cut reviewer. While we’re doing numbers, let’s investigate which of the Round-1 questions were hard. In decreasing order of difficulty, identified by correct answer, we find: Dalvik (97.5% correct), 160 (96%), Looper (58.5%), LLVM (57%), fyiWillBeAdvancedByHostKThx (43%), and PhoneNumberFormattingTextWatcher (19.5%). First, to Kris Jurgowski, who pulled an all-nighter and wrote a nifty little app... on a Motorola CLIQ running Android 1.5! Next, to Heliodor Jalba, whose app had some gravity-warping extras and was less than 11K in size. And finally, to Charles Vaughn, whose app included a hilarious “Party Mode” that brought a smile to everyone’s face. When Google I/O sold out so fast, were kicking around ideas for how to get some of our ticket reserve into the hands of our favorite people: Dedicated developers. Someone floated the idea of a contest, so we had to pull one together double-quick. You can read the questions and first-round answers here.